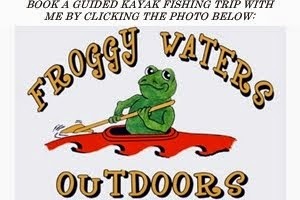 For the second year in a row, I am honored and humbled to be nominated for blog of the year in the Kayak Anglers Choice Awards 2013 held by YakAngler.com. A few years ago, when I started this blog, I was in the midst of graduate school and was constantly surrounded by numbers, equations, computer codes, and textbooks. Man Powered Fishing became my escape to share my stories and experiences out on the water or, occasionally, in the woods or kitchen. I hope my passion for the sport shows through in everything I write. For me, there is nothing I enjoy more than comments, emails, and questions I get after I blog about a trip, recipe, or review because I know I had a positive impact on someone or the sport. I encourage you to go and check out all of the nominees in all of the categories BY CLICKING THIS LINK. A lot of my good friends in fishing are nominated, including many in the 'Blog of the Year' category. Vote for who you feel deserves to win and hopefully it is me! They are doing a weekly elimination format this year, so you can vote once each week. Oh and the fall bite...it is red hot! More on that coming soon. Tight lines!